Solpadol is the brand name for this medicine, which is otherwise known as co-codamol. It is used to treat moderate pain in cases where milder pain relief (such as paracetamol or low-strength NSAIDs) fails to provide adequate assistance. This type of pain may be a severe headache, toothache, back pain, joint pain, or have been caused by an injury or surgery. The central acting agents in this medication are codeine and paracetamol. Codeine belongs to the opioid analgesic category of painkillers. It works by releasing chemicals in the brain similar to endorphins, which help to convince pain receptors that the pain is no longer there (even though the cause of it may remain). Paracetamol works on nerves around the injured or affected area itself, by making them less susceptible to feelings of pain. Lower-strength doses of co-codamol do not require a prescription. 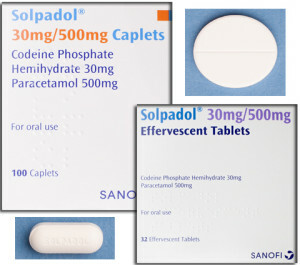 However, you can buy Solpadol in the UK in higher strength dosages only after consulting with a GMC-registered doctor. This is so that a qualified person can assess the risk of you encountering harmful side effects. You may be unable to purchase painkillers online if you suffer from certain medical conditions. Possible side effects of this medicine include dizziness, nausea and vomiting. The information listed here is not extensive. For a full list of side effects and restrictions, read the safety information leaflet provided. We will only ever use tracked, next day courier services to deliver your order. If our pharmacy receives your order before 3pm on a weekday, you can expect to receive it the following working day. For your safety and privacy, all of our orders are sealed in plain and secure packaging before being shipped. For your own safety, it is essential to use a website you can trust when buying pain medication. When you order with us, we put your safety first at all times. All orders are reviewed by qualified doctors, who will issue a prescription to you only if they are satisfied that a medication is suitable. This electronic prescription is then passed on to our dispensing pharmacy, based in the UK, who will handle your order with the utmost care.